In this exclusive audio interview Emmy Winner Charlotte Robinson host of OUTTAKE VOICES™ talks with Bruce Vilanch about hosting One Night Only Benefit Cabaret for the Richmond/Ermet AID Foundation on Monday Sept 12th at Marines’ Memorial Theater in San Francisco. Philanthropy and stellar entertainment take center stage as REAF presents a special one-night-only benefit cabaret with the Broadway Touring Cast of “Beautiful”(The Carole King Musical) in “Motown & More, An Evening of Music, Dance & Comedy” hosted by Bruce with Countess Katya Smirnoff-Skyy. Songs from “Beautiful” will not be performed. As we have been reporting, for over twenty years the Richmond / Ermet Aid Foundation has raised millions of dollars by producing Broadway quality entertainment events and galas to advance HIV treatments and support AIDS services until there is a cure. Recently REAF has expanded its fundraising focus to the Bay Area’s growing demand for two new areas by providing food for the needy and programs that support homeless, disadvantaged and disenfranchised youth. We talked to Bruce about this fabulous organization and his spin on our LGBT issues. 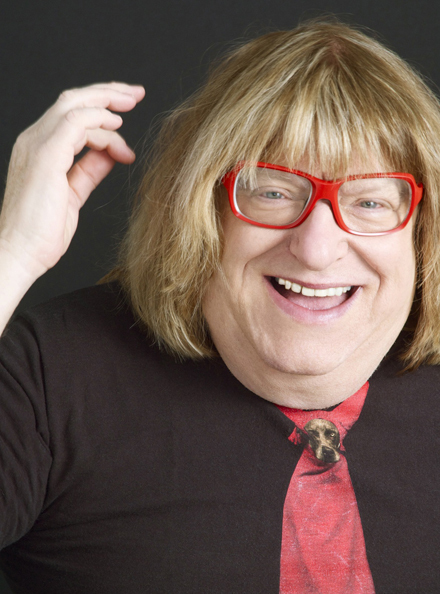 Bruce Vilanch is one of the most sought-after jokesmiths in the entertainment industry. He began contributing to Academy Awards telecasts in 1989 collaborating with the likes of Billy Crystal, Whoopi Goldberg and David Letterman and graduated to head writer in 2000. Since then Vilanch has become a recognizable face in his own right thanks to the feature-length documentary "Get Bruce” and his one-time stint as a regular on "Hollywood Squares" for which he also served as head writer. One Night Only Benefit Cabaret is produced by the Richmond/Ermet Aid Foundation, founded by the late Barbara Richmond and Peggy Ermet in memory of their sons John Richmond and Doug Ermet who both lost their lives to AIDS. To date REAF has raised well over $3 million dollars for AIDS services and beginning in 2015 expanded to support hunger programs and programs for homeless and underserved youth. I like hearing the down to earth side of Bruce.....although he's always a funny guy!